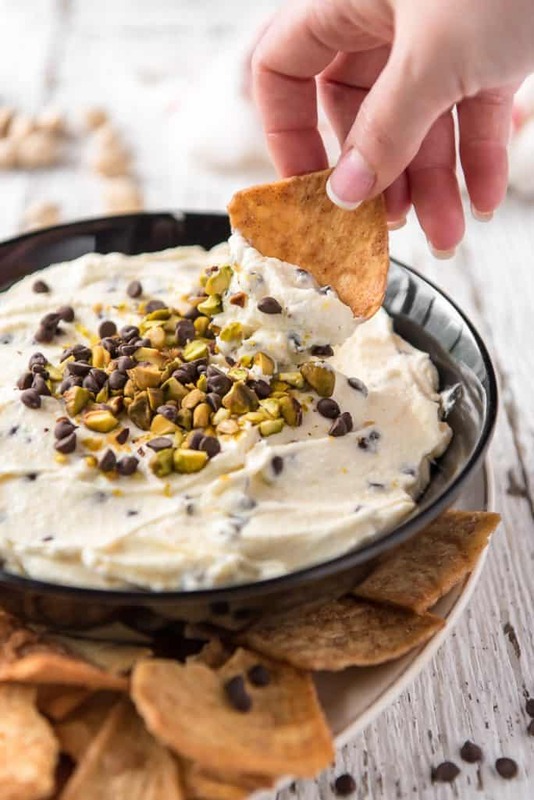 When you’re looking for a quick fancy dessert, 5 ingredients and 5 minutes are all you need to whip up this creamy and authentic Cannoli Dip! Made with mascarpone and a touch of orange zest, this dessert dip is a delightful addition to any party or get together. Do you guys love international cooking as much as I do? Between all the Asian, Spanish, and Italian recipes we make, we almost have a rotation going on in our house. Oh, cannolis. I have a love affair with those crispy, creamy tubes of Italian amore. But the process of making them is not always my idea of a fun afternoon. And that, my friends, is when I turn to this flawless Cannoli Dip. JUST TAKE ME TO THE CANNOLI DIP ALREADY! 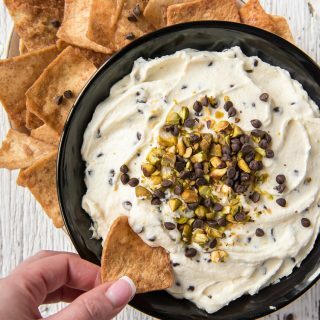 If you’d rather skip my (pretty darn helpful) tips and tricks, essential cooking info, and similar recipe ideas – and get straight to this deliciously easy cannoli dip recipe, just scroll right on down to the bottom of the page where you can find the printable recipe card! Just because Valentine’s Day is upon us doesn’t mean you need to spring for a box of waxy chocolates for the one you love. I mean, come on. This is the 21st century, and those things are so 1990. Roses, sure. A nice dinner, hell yeah. As far as dessert goes, a batch of this homemade Cannoli Dip will satisfy sooooo much better than mystery candy. It checks off all the boxes: chocolate (chips), nuts (pistachios), fruit (the orange zest inside gives it almost a creamsicle flavor!). So yeah. Clearly. Skip those heart-shaped boxed chocolates this year and share a bowl of this stuff instead. What Is Cannoli Dip Made Of? Traditional cannoli filling is made of whole milk ricotta cheese (using low-fat is OK too). Other cannoli dips are often made with a combination of ricotta and cream cheese or Neufchatel, giving it a thicker, smoother consistency. 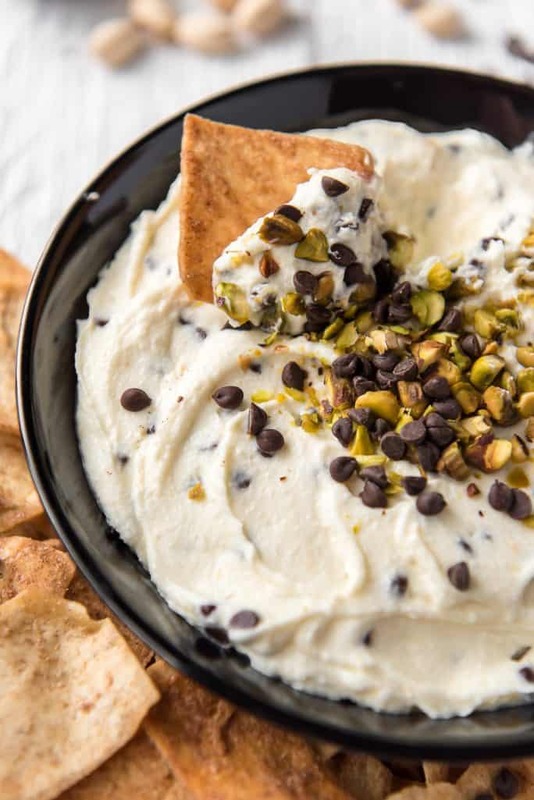 This cannoli dip uses a 3:2 ratio of ricotta and Mascarpone cheeses. It’s perfectly creamy, but retains a bit more of that tasty cannoli filling-like texture and richness. 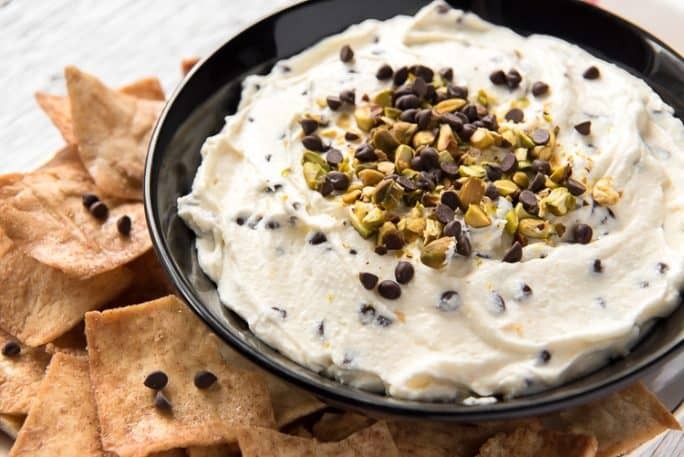 In addition to the cheese, cannoli dip contains powdered sugar and vanilla extract. Optionally, you can blend in a bit of orange zest (candied orange peels are common in traditional Italian cannoli) and mini chocolate chips. Top the final dip with more chips and a handful of chopped pistachios for a nice crunch. Obviously, cannoli chips would be the first thing I would grab! And yeah – they are actually a thing. If you prefer fully homemade, you could also take my cannoli shell recipe and cut the dough into chips before frying it instead. As far as sweeter chip-like dippers, graham crackers and cinnamon-sugar pita chips are great. Pizzelle cookies, vanilla wafers, and broken waffle cones are other similar (but less flavored) options. Fresh fruit tastes delish in this cannoli dip as well! Strawberries, apple slices, and orange segments are by far my favorite. Can You Make Cannoli Dip In Advance? YES! You can make this dip anywhere from a few hours to 1 day prior to serving. Does Cannoli Dip Need To Be Refrigerated? YES! This dip contains two kinds of soft cheese that require refrigeration. Keep the dip refrigerated until you’re ready to serve it; return it to the fridge no more than 2 hours after pulling it out. Can You Freeze Cannoli Dip? YES! 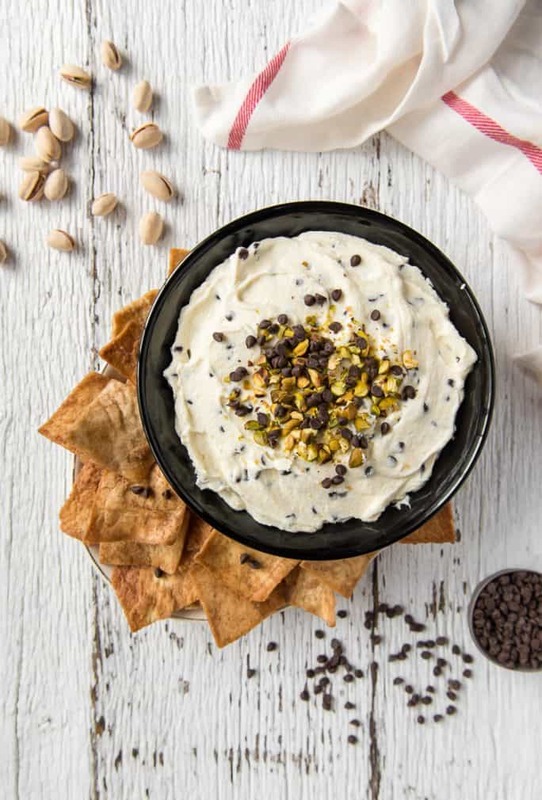 Stored in an airtight container, this cannoli dip will last for up to 3 months. First, drain the ricotta cheese. Place a colander in the sink and line it with cheesecloth, then place the cheese inside. Wrap the cheesecloth around the ricotta, then place a heavy can on top top help press out the whey. Allow the ricotta to drain for at least 1 hour before continuing. When the ricotta is drained, use a hand mixer blend the ricotta and mascarpone together in a medium mixing bowl until it’s well combined and smooth, 2-3 minutes. Next, Add the vanilla extract and powdered sugar, mixing until fully incorporated, 2-3 minutes more. Then fold in the orange zest (if using) and the mini chocolate chips until evenly combined. Cover the bowl with plastic wrap and chill the for at least 10 minutes before serving. 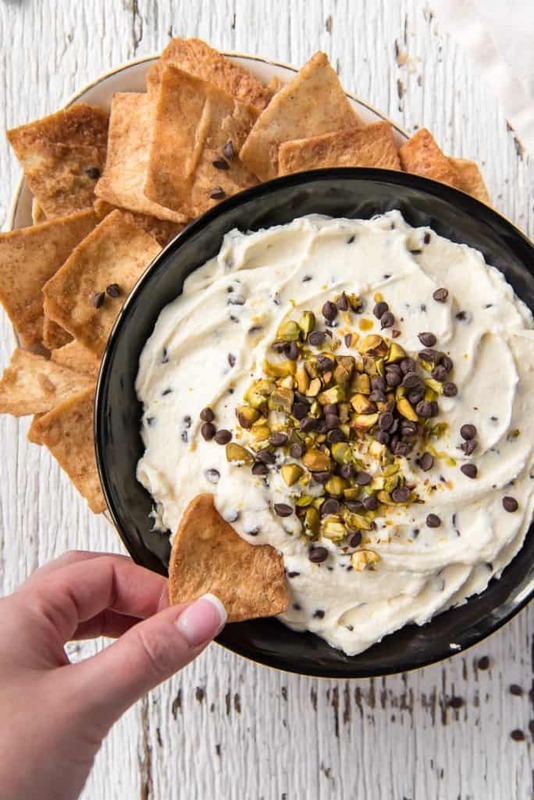 Garnish the cannoli dip with more chocolate chips or chopped pistachios when you’re ready to serve. 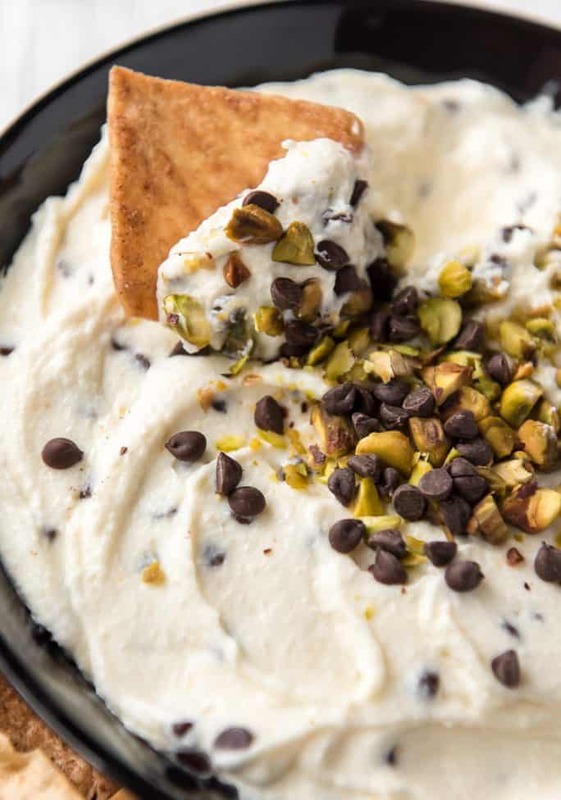 When you're looking for a quick fancy dessert, 5 ingredients and 5 minutes are all you need to whip up this creamy and authentic Cannoli Dip! 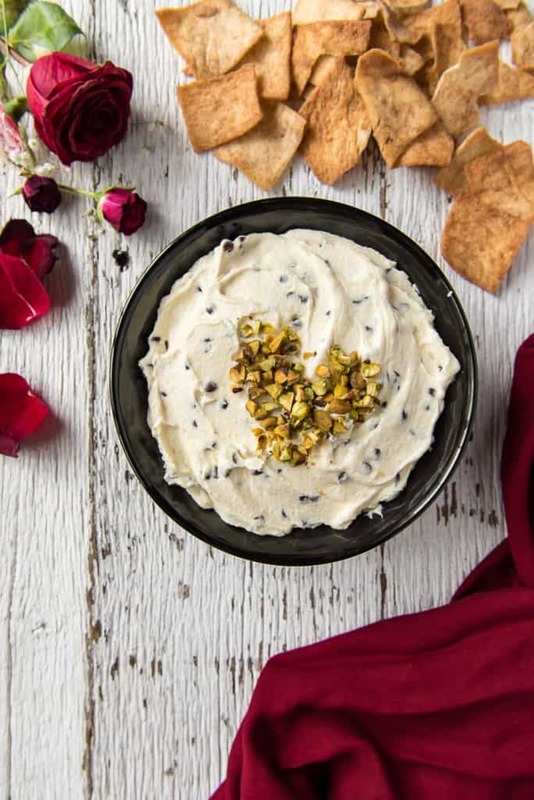 Made with mascarpone and a touch of orange zest, this dessert dip is a delightful addition to any party or get together. Beat ricotta cheese and mascarpone cheese together in a bowl until combined and smooth, 2-3 minutes. Add powdered sugar, vanilla, and orange zest (if using). Mix until sugar is completely incorporated, 2-3 more minutes. Fold in chocolate chips until evenly combined. Transfer to serving bowl, cover with plastic wrap, and chill until ready to serve. Garnish with additional chocolate chips and chopped pistachios before serving, if desired. Serve with cinnamon pita chips, graham crackers, pizzelle cookies, broken ice cream cone pieces, cannoli chips, and fresh fruit. 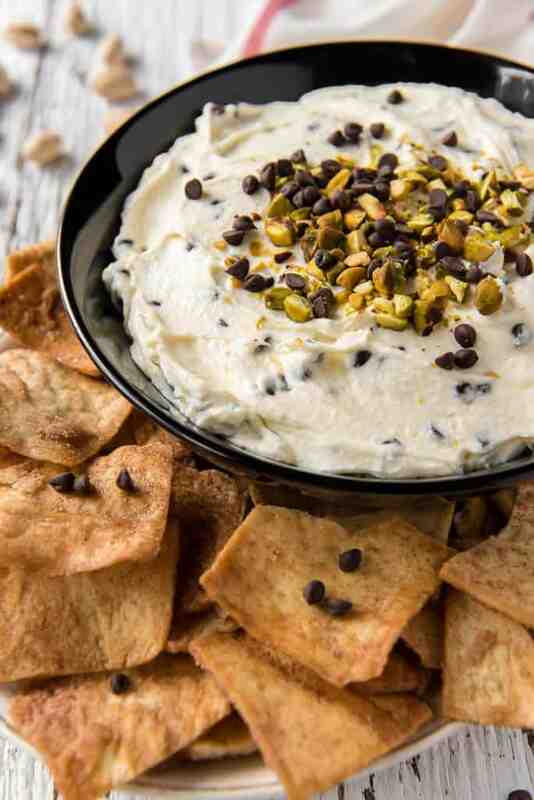 PIN THIS CANNOLI DIP RECIPE FOR LATER! This looks delicious and also easy! I’m sure it will be a big hit at my next party. Thanks for sharing! Now this is my kind of recipe simple and tasty. It really looks good. I’m craving this right now and it’s only 8 a.m.! What a great little treat for when you’re watching a movie or entertaining! I love this idea! Orange zest and chocolate chips and pistachios all added in sounds totally decadent and delicious. I’ve never tried this before but it looks so delicious I think I will have to try it! This dip looks so scrumptious,, I would love to try it!! Fabulous food site! Ooh, I am seriously into this! This sounds really yummy, and I just added the ingredients to my shopping list. I love how quick and simple this is! It is the perfect dessert for a get together or just for a sweet treat at home! This looks delicious! I love Cannoli’s and can imagine this would be so tasty and easy.